There’s nothing quite like having a good snack in the house and what’s better than having a snack that uses real ingredients! As part of my 2019 intentions, I’m (slowly) trying to wean out packaged snacks and focus on making real-food snacks at home. I’ve been buying Koukla Delights, which are delicious, but I wanted to create something that I could easily make at home. This is a wonderful and satisfying little cookie to snack on throughout the week (if they last that long) and they only have four ingredients! This is a fast and easy cookie recipe that you can bake or eat raw! 2-4 tbsp Maple Syrup Depending on how sweet you’d like them! Process the coconut and almonds in a food processor until really fine. With the processor running, drizzle in the maple syrup until mixed. 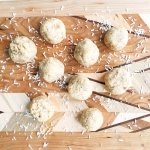 Using a tablespoon, scoop out the dough and roll into balls. Gently press down just to get the bottom a bit flat so they’re not rolling all over on you! Note! These are great raw too so if you don’t fee like baking, eat them raw! Inspired and adapted from Koukla Delights’ Vanilla Coconut Bites. Looking for another snack idea? Try my Date Balls with Coconut and Walnuts!